Europe is indeed the heart of western civilisation, with an emphasis on the word “civilisation”. The western European countries always seem to be able to produce fine food, fine wines and beers, fine arts and, for the past 100 years, fine cars. As a generalisation, the cars built in northwestern Europe (i.e. Germany and Sweden) seem to be more stately and well-built than the flashier French and Italian offerings (the stereotype would have the people matching the cars). One of the benchmark cars in the “executive” type is the renowned BMW five series, of which the 530i is a brilliant example. On the road, the BMW 530i has impeccable manners and handles the road in a very civilised manner. Dynamic traction control and a comprehensive dynamic stability control system keep the car on the straight and narrow without wandering, and the speed sensitive steering is a lovely added touch. The suspension gives a lovely ride, not hard enough to make a rough surface too jerky, but hard enough to provide the driver with feedback (from a passenger point of view, this means that if you’ve got a drink in the cup holder, it won’t spill when being driven sedately along a roughly sealed back road, but writing a letter isn’t a good idea if you want the result to be legible). The ABS braking system with brake assist and corner brake control means that the BMW 530i is able to stop smoothly, swiftly and safely. The outline of the BMW 530i is smooth, sleek and uncluttered with a few crisp edges to add definition. The beauty of its form, in both sedan and wagon body styles, is much more harmonious and subtle than the look-at-me styling preferred by boy-racer types. That being said, the BMW 530i would be able to surpass many of the dinky-toy cars. Beneath the elegant lines of the bonnet lies a 3 litre powerhouse that can unleash 255 horses (200 kW), so to speak, at 6600 rpm. Capable of accelerating from 0 to 100 km/h in 6.5 seconds then going on to the top speed of a speed limited 250 km/h, the BMW 530i is a swift and powerful vehicle. It is a true pleasure to communicate with this powerhouse via the 6-speed automatic gearing system. On the inside, the beautiful lines of the exterior are echoed in the “bubbled” dashboard shape, where the classically styled analogue tachometer and rev counter will keep you informed of how your BMW 530i is performing. The leatherette seats are very comfortable, and with a number of ways to adjust both the driver’s and the front passenger’s seat, which are bucket seats with lumbar support. The necessary airbags will surround and protect you in case of a collision (but the front passenger ones won’t deploy if you are alone, as the airbags come with an occupant sensor). The BMW 530i can seat up to five people, and the latest models have improved the legroom in the rear, a fact that will be welcome to passengers. Creature comforts are well catered to, with the 10 speaker system bringing pleasant music from the MP3-compatible CD system, and a sophisticated sun-sensing climate control system. The BMW 530i comes in sedan or wagon form. 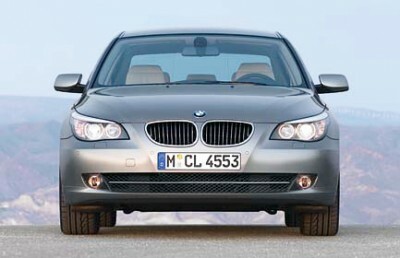 The BMW 530i is a beautiful example of technical performance, comfort and design. Perhaps it gives a new meaning to the words “civil engineering”? For any more information on the BMW 530i, or for that matter any other new car, contact one of our friendly consultants on 1300 303 181. If you’d like some fleet discount pricing (yes even for private buyers! ), we can submit vehicle quote requests out to our national network of BMW dealers and come back with pricing within 24 hours. Private Fleet – car buying made easy!